Click the status area located in the bottom-right corner of your desktop. You might recall that the status area contains your clock, Wi-Fi indicator, and battery charge level indicator. It is also pictured here. A window launches and loads your Chromebook Settings page. A Keyboard Settings dialog box appears, pictured here. Reconfigure your Search, Alt, and Ctrl keys. Turn your shortcut keys into function keys (F keys). Change your keyboard language configuration. The Keyboard Shortcut Help tool appears in an onscreen overlay, as shown in the last figure. Press Ctrl, Alt, Shift, or any two of these three keys in combination. 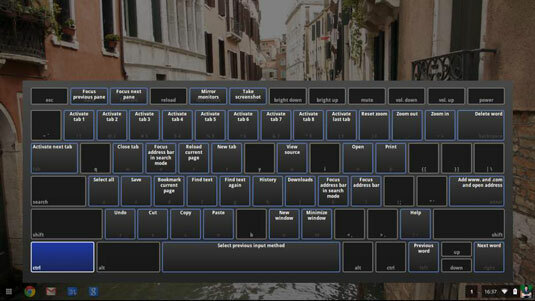 A keyboard shortcut map specific to the key (or keys) you press appears. 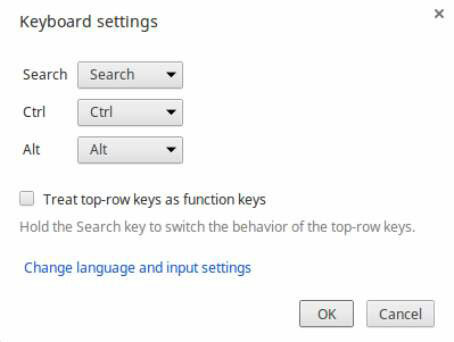 Use the Keyboard Shortcut Help tool for a quick reminder as you use your Chromebook.